At about 11p as the party seems to dwindle down everyone gets fired up when the Wii Rock Band comes out. 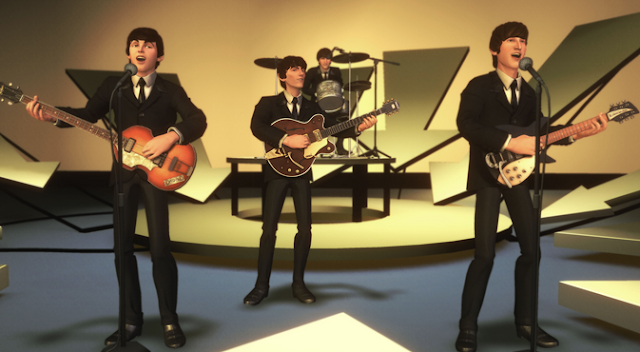 The Beatles Rock Band on Wii lets everyone sing some of their best tunes. Although not a professional singer myself, you can usually see me really let lose on a drive in my car or at home on Rock Band. There's nothing like singing lyrics that move and excite you. For me it's a matter of being transported somewhere else and feeling the thrill of jamming to music. Everyone does it, even if they can't carry a tune. I'm guilty of trying to hit some high notes myself, but for the most part I do pretty well. Twist and Shout always rips my throat apart, I don't know how John Lennon hit those high notes, but I am glad he did.